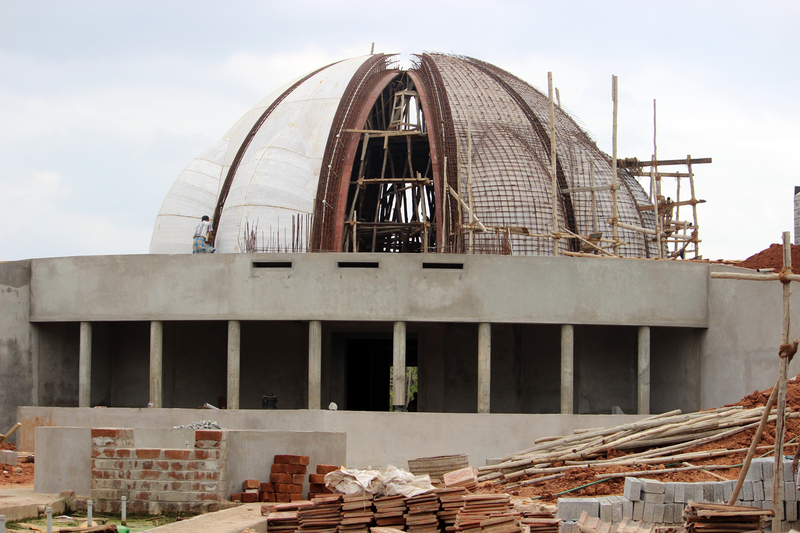 Back on the bus we are headed for Swami Satchidananda’s childhood home and the lotus shrine, under construction, behind it. We are in a neighborhood. There are children walking home from school, houses lining the street and the smells of the evening meal being prepared. As we park in front of the modest home we are warmly welcomed and asked to come in. It appears the home is also undergoing some improvements and renovation. Throughout most of the structure the roof is missing. Each clay tile from the 1865 roof has been removed and hand washed so it can be reused. We see evidence of this as we make our way outside. 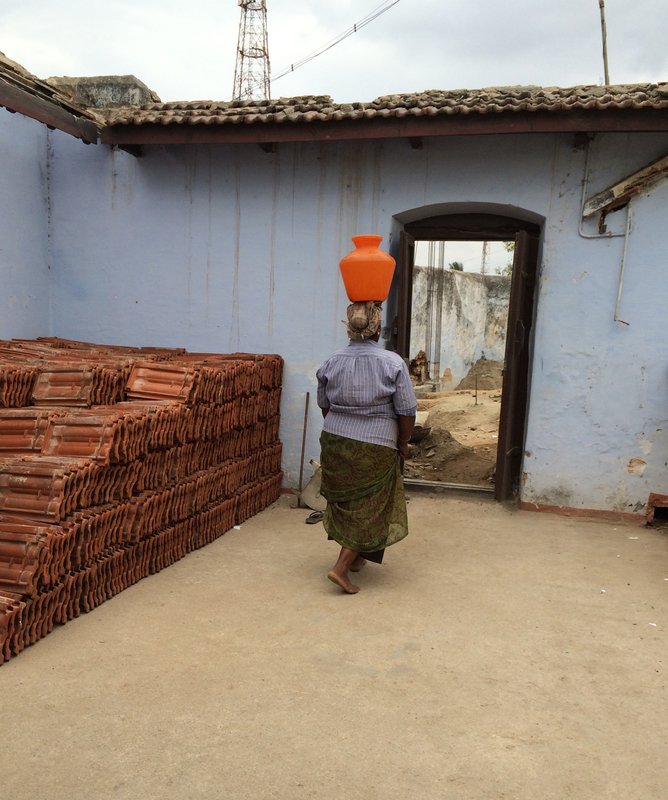 A neat stack of tiles is piled against a wall, while a woman sits halfway in a vat of water caressing the dust and years off tiles for future use. As we pass through the house into the “backyard” where the lotus shrine is being constructed, a couple of thoughts hit me simultaneously: 1. Why didn’t I get my tetanus booster? and 2. How do they construct so precisely with such primitive tools and bare feet? The concrete walls are perfect. The petals of the shrine measured exactly and formed flawlessly. Walking up a ramp to view the top of the lotus it is obvious to me there is no real sense of liability in India. People here are trusted to take responsibility for themselves. There are no guardrails, we’re probably 15-20 feet up, and there’s no attempt to warn or protect us. 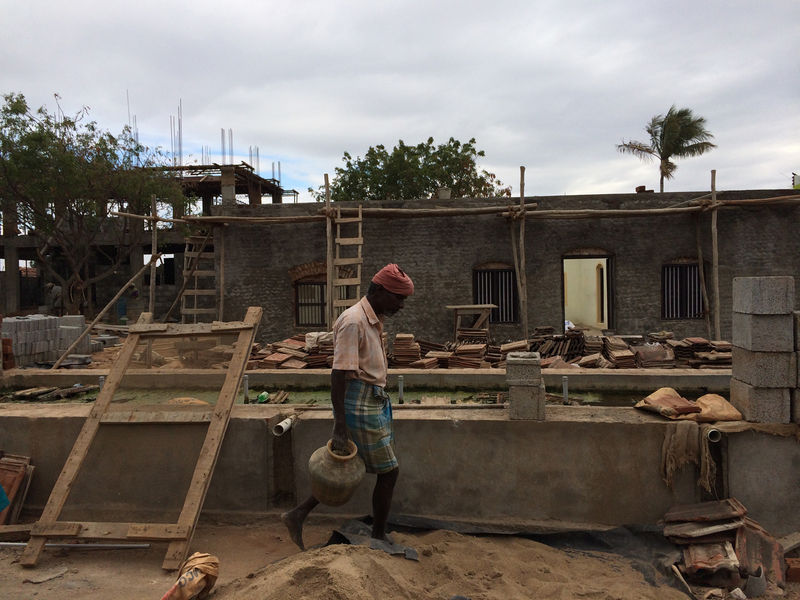 There are sawed off posts sticking up 3 inches to 2 feet right in the middle of the walkway, rusted nails protruding from cast off boards, mud here and there and workers in dhotis, bare feet, bare hands and big smiles meandering near and through us. I walk ever so gingerly around this 4 foot wide concrete path. At one point one of our group is walking toward me, she wants to pass. I stand right where I am, on the inside, the safe side. She stands in front of me silently challenging me to move, because she too wants to be on the more cautious side. I relent. I side step long enough to let her pass then take back my spot. Still for just a moment, we begin to make our descent down the muddy hill. Once we’re on “solid” ground again I exhale. The guided tour has been lost to me. I don’t know what anyone said, when it will be completed or how they are doing it, but I am no longer in peril. Real or imagined. We create a circle in the center of the lotus shrine – on the ground floor – to chant a blessing. Chanting is like breathing here. We chant a blessing on the bus every time we take off. We chant early in the morning during meditation and yoga. There is a meal chant, a house blessing and a chant for peace. Nothing in this world has to go without a chant. I like it, it creates a sense of presence and appreciation for whatever it is and wherever I am. It’s an audible prayer sent into the ethers for support and gratitude. Before we leave we will chant once more in the roofless home for it’s good fortune and the health of all that are working on it and those who will visit. The gentleman who welcomed us here, Mr. Timpossiblylongname, has graciously invited us to tea at his home. We accept. I love going to the homes of people here. Anywhere really. A home is an intimate look into its residents. Selections of furniture, art, fabrics or lack of those things can all provide insight. It’s not judgment, I let go of that years ago when I was working as an interior designer, it’s anthropology. Anyone can buy an expensive rug and pretend to be something they’re not, and it’s usually pretty obvious. I’m interested in the heart of the home, what receives the most importance. In most homes we have visited here, a puja corner or room is set up. Their faith comes first, a close second, or maybe close tie, would be family. The homes are simple and clean. They are clear of distraction and ornament. They have no need to explain themselves through their furnishings, instead they have time and space for each other, developing rich relationships with friends, heartfelt and meaningful conversations and a good night’s sleep. This place is no different. We are invited to sit on the veranda, a large covered, tiled space. Chairs are provided for all of us. Mr. T’s lovely wife and daughter greet us with big smiles. Our time together begins with talk of our adventures thus far here in India. We exchange pleasantries, compliment him on his home and thank him for his graciousness. A tea order is placed. As we’re waiting for our tea to arrive Swamiji asks us to go around the circle and share what India has meant to us so far. It was a lovely sharing with heartfelt words and sentiments and even a sweet song from Kali. There is a knowingness in the faces of those who are from here. The people of India know there is something transformative here. They are very proud of their country and especially their own town or city. Where we may see opportunity for growth, clean up or change, they find gifts. They’ve so much to teach us. Full of freshly brewed tea we are herded back on the bus for our final destination this evening; Swami Satchidananda’s grandson’s home for dinner. A swami is a renunciate. He or she is not married and certainly has no children. So how then can we be visiting the grandson of this great swami? Before he took his vows, Swami Satchidananda had been a householder, married and with two sons. The call to monkhood was too great so when his sons were young he took his vows and left his family behind. This had all sorts of implications as you can imagine but over time it became understood that this was his true path. As a swami he felt that family should be treated like everyone else, that everyone should be treated exactly the same. For his children and grandchildren this was difficult to understand and as a result, this grandson we are visiting tonight was the only one who took the time to try to get it. And so he is hosting us, followers of his grandfather’s style of yoga and spiritual philosophy. We are greeted first by his wife. We pile into the living room and are immediately served fresh watermelon juice or coconut juice. I love this hospitality, it’s so gracious and so lost in our hurry-up-and-get-it-done kind of world. She shares stories of her childhood and a no-name saint Swami Satchidananda had come to visit at her grandfather’s home. She introduces us to her children, a 12 year old daughter and a younger son who has come in from outside with a neighbor friend. The neighbor boy’s eyes are huge as he takes in all the foreigners ringing the room. 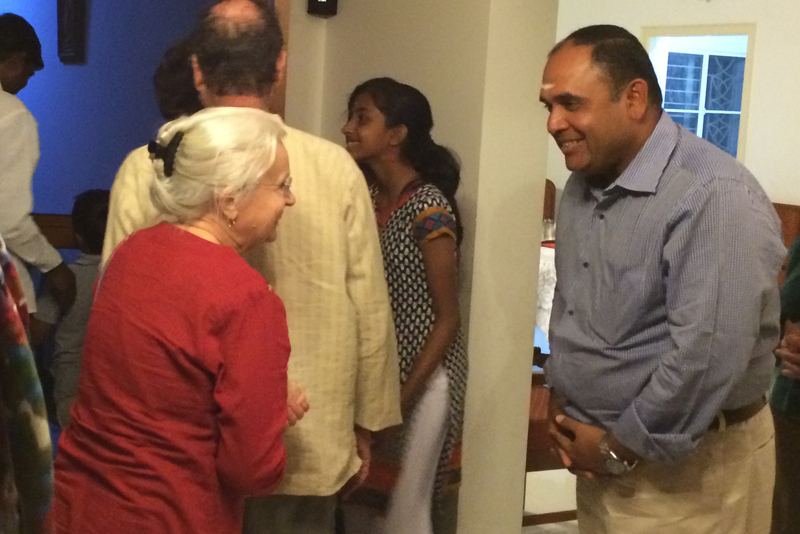 A few moments later Murugesh, the grandson, joins us with apologies for his tardiness. I like him immediately, his face is open and warm and he looks genuinely happy to see us in his home. He asks how our trip has been. Then he shares some heartfelt stories about his grandfather, answers a few questions then shares a video of a new year’s eve satsang Gurudev gave some years ago. Swami Divyananda asked him to limit it to about 15 minutes, he agreed. But once it started he seemed to have a difficult time turning it off. Even after Swamiji tapped him on the arm, he stood with the remote in his hands for a few more minutes as if to find the perfect place to end it. It’s clear he truly admires and loves his grandfather. Even though his family lived in the United States for several years, and adopted a few western mannerisms and amenities their home is still warmly Indian and they have held onto the most lovely customs. In Coimbature, not much more than 100 years ago there was a drought which led to a famine and hundreds of thousands of lives were lost. Shortly after, the plague ravaged the same area taking more lives. As a result, this city in particular is critically concerned that you get enough to eat. Instead of, “How are you today?” they may ask, “Have you eaten today?” Food is plentiful at meals, extra helpings dished onto waiting plates and banana leaves before a dent is scarcely made. It is also important to the people of this beautiful city that you know how to eat, how to pair your food and what is appropriate for lunch but not dinner. It is all done with love. Our meal is exquisite and we all go back for more than one helping, some more than two, pleasing our hosts. As we’re eating, conversations become more casual and personal, a few memories are shared and a handful of friendships among members of our group begin to deepen. We are relaxed. We have been going non-stop and as much as many of us would like to believe we’re going with the flow there is still a mild tension that builds when there is a schedule to keep. It is moments like this when we can release the need to be somewhere at some time and just enjoy the richness of each other’s company. Having consumed to our capacities we release our plates and sit back. Murugesh introduces us to the genius who created all the delicious food and his staff. We appreciate them all then begin to say our goodbyes. It has been a beautiful evening honoring the reason we are here, Swami Satchidananda. He’s kept alive in the fond, and sometimes funny, memories of others and the works and good deeds he has left behind. and found most people will ggo along with your views on this web site.